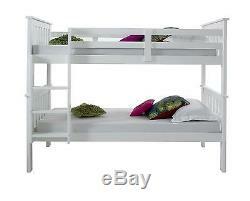 CONTEMPORARY SOLID WHITE BUNK BED SET + 2 MATTRESSES. A strong and modern style bunk bed finished in solid lacquered white with safety bars a strong ladder and solid wooden bed slats. The Brazil Atlantis White Bunk Bed will light up your childrens bedroom and features a solid Pine wood construction that is highly durable. It has safety bars for peace of mind as well as a ladder and bed slats to give you a practical space-saving bunk bed and very easy to split and use as separate 3ft Single beds. 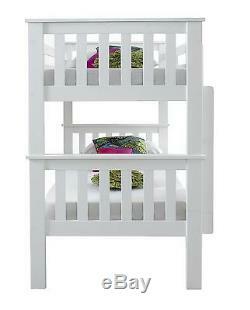 Brazil Atlantis White Wood Bunk Bed. Solidly built with Modern and Simple design for adults and children. Antique Lacquered Solid White finish. Manufactured using high quality Pine Wood. Four safety rails with a strong fixed ladder for additional safety. Easily Separates into Two Single beds. Luxurious and high quality frame. Solid wooden slatted base for additional comfort and mattress life. Manufactured for easy self assembly. Mattress Type: The following specifies the features for your mattress Spring Mattress. Under bed Gap:29.5cm. Gap between Bunk Beds(without mattress):81cm. Mattress Depth: 18cm All measurements are approximates. Sleeping on the most comfortable mattress ensures that you have the best nights sleep. Thats why we offer made-to-order mattresses which completely satisfy your needs. As a rough guide, you and your partner should be able to lie next to each other with your arms behind your head and elbows out, without touching. Your bed should also be 10-15cm longer than both of. Please be aware that while most small single mattresses will fit a bunk bed, often top bunks require a thinner mattress (typically no more than 15cm) to ensure safety for the occupant. Open spring mattresses are the most common kind. Theyre made of coil springs wired together, so that when you lie on them, they all move at once. Pocket sprung mattresses are generally better quality. Every spring is housed in a fabric pocket, and all of them are packed closely together. The springs all work independently of each other, which mean they minimise roll-together. The more springs there are, the better supported you will be. Memory Foam & Latex Mattresses. Memory foam was originally developed by NASA to absorb the tremendous forces astronauts are subjected to during lift-off. It continually reacts and adjusts to your body heat and forms the perfect contour to your body. Latex is less responsive but helps minimise pressure on joints and gives relief from the stresses and strains of everyday life. Our orthopaedic mattresses are normally firmer and more supportive. They follow the contour of your body and guarantee a long-lasting and solid support during your sleep. They allow your body to relax at comfort. Pillow top mattresses feature an extra layer of soft, pillow-feel material on top of the full standard mattress. These mattresses are top-sided, and not necessary to turn the mattress over, only to turn it end-to-end every so often. Quilted mattresses give a smoother finish because quilting material has been attached to the surface fillings. Tufting is where tapes are passed all the way through the mattress at regular intervals and secured at each end; preventing loose fillings from being dislodged. Divan bases work well with all mattresses. They feature a spring-less base with a wooden frame and an upholstered layer on top. Bedsteads make a stylish choice and are available in a number of different designs and materials, from classic wooden frames to more contemporary leather or metal upholstered styles. We deliver throughout the UK. However, we charge an additional amount to deliver to some offshore or remote mainland destinations. We have done our best to get around this, but cannot find a service that will deliver at normal rates. Isle of Arran & Great Cumbria. With large items, the driver may request for assistance. This page (together with the documents referred to) tells you the terms and conditions on which we, Bluemoon Beds, supply any of the products listed on our online site. These terms and conditions only apply if you are a consumer. Trade customers are subject to our trade terms and conditions which can be accessed by calling us. You should understand that by ordering any of our products, you agree to be bound by these terms and conditions. Please understand that if you refuse to accept these terms and conditions, you will not be able to order any products from our site. 1.1 These Terms and conditions apply to all orders placed online and over the telephone. By placing an order with Bluemoon Beds you are accepting to abide by these conditions. Please read them carefully and contact our Customer Service team if you have any questions. 1.2 If you do not wish to comply with these terms and conditions, then you should not place an order and enter into a contract with Bluemoon Beds. 1.3 Please note that these terms and conditions do not affect your statutory rights. 2.1 Our site is only intended for use by people resident in the United Kingdom (mainland only) and we do not accept orders from individuals resident elsewhere. 3.1 By placing an order through our site, you warrant that: 3.1.1 You are legally capable of entering into binding contracts; and 3.1.2 You are at least 18 years old; and 3.1.3 You are resident in the United Kingdom; and 3.1.4 You are accessing our site from the United Kingdom. 3.1.5 All orders are subject to acceptance. All details supplied to Bluemoon Beds must be true and accurate. 3.1.6 If there are any problems with your order we aim to contact you as soon as we can. 3.1.7 All Images displayed are indications of the product; some items may have small variations in ticking and colour, usually as a result of varied screen resolutions. 3.1.8 If you have difficulty placing an order, please contact our sales team who will assist you. 3.2.1 In the event that any product is displayed with an inaccurate price we have the right to withdraw and cancel the order prior to a contract being made (please see section 3 for order contract information). 3.2.2 Any errors that have been made in the description of our products will be rectified as soon as possible. 4.1 Prices displayed on our website are inclusive of VAT. 4.2 For customers residing off-shore and exempt from paying VAT, please call prior to placing any orders. 4.3 The total price payable, for all items ordered will be debited, from the account provided, at the time that the order is placed, once a contract has been made (see section 3 for order contract information). 4.4 We can only accept payments from U. 4.6 All billing information given must match those held by the bank that issues the card that you are paying with. Failure to supply the correct information may lead to a delay or cancellation of your order. 5.1 All products and services are subject to availability and may be withdrawn at any time. 5.3 Any items that are not in stock have a lead time. Where there are delays we aim to notify you as soon as we are informed. 6.1 These are goods that are not stock items and are made to your specific requirements, e. Special sizes or items that are made to non standard specifications. It is important that you are happy with the items that you are purchasing as they are non returnable and non refundable (unless they are faulty). 7.1.1 All default deliveries may take place anytime of the day, with a one-man service, to the ground floor of the property. 7.1.2 Please check over your items to ensure that they look to be intact before signing for them. This includes checking all the parts. Please contact Customer Services who will be happy to rectify this problem as soon as possible. 7.1.4 If you do sign for goods and later discover them to be damaged, please contact customer services within 24 hours and be aware that we may require photographic evidence of the damage before action can be taken. After signing for goods as received, any collections/exchanges thereafter will incur courier charges. So please ensure the goods are checked carefully before any documents are signed. 7.1.6 Parts Please check all parts of the order for any deficiency in quantity or damage before assembling or arranging an assembly service. We will not be responsible for any re-visit charges or wasted hours of the assembly service. We do not deliver to regions outside of UK. 7.1.8 Please ensure that your property is directly accessible to a vehicle which is approximately the size of a fire engine. 7.1.9 Bluemoon Beds cannot cover any losses arising from incomplete or damaged deliveries. 7.1.10 Orders maybe split and delivered on different days or times due to the nature of the product and its supplies. 7.2 Deliveries - Days and Time 7.2.1 We use a carrier service for our National deliveries. Bluemoon Beds are unable to cover any loss of earnings etc. For these occasions but will do our best to get your goods to you as soon as possible. 7.2.2 All of the items are delivered by ONE MAN (unless a two man service has been specified and paid for when required), to the first accessible ground floor door of the premises. The driver will not take items up steps to get to this door and are not insured to take any items into your property. 7.2.3 With larger items the driver may require some assistance to offload the items. 7.2.5 Saturday deliveries are available without any time slots. 7.3 Do you do more than just deliver? Can you install my bed? 7.3.1 Yes, we also provide services to install your bed (for divan beds only) and take away the packaging. This however needs to be pre-organised and will require a charge which goes directly to the servicemen, not to us. Unfortunately, we cannot offer this service for Bed Frames and Bunk Beds. Depending on the courier we use and for a charge, we can collect and recycle your old bed or mattress when we deliver the new one. 8.1 PLEASE DO NOT DISPOSE OF YOUR EXISTING ITEMS UNTIL YOU HAVE RECEIVED YOUR ORDER FROM US. 8.2 Although at Bluemoon Beds we always strive to deliver within the agreed dates and times, we do occasionally come up against problems that can make this impossible. Please be patient with us and we will do our very best to assist you. However there will be a charge for this (see section 9). If you require the goods to be left without a signature, Bluemoon Beds will not be held responsible for any theft or weather damage of your goods. The goods will be left at your own risk and will only be left if there is a signed and dated note, with the customers permission, for the driver to take. We do not recommend that your goods are left outside, due to threat of weather damage or theft. 11.1 If your item develops a fault we will deal with your complaint in accordance with your rights under the Sales of Goods Act 1979. If a mattress is deemed to have dipped, the dip needs to be equal to or larger than 2.5 inches (6 cm) for it to be considered as a fault. We require images of the fault. If you find your goods to be faulty, damaged or incorrect please refuse the items and contact Customer Services within 24 hours. 12.2 We ask that you inspect your goods within a reasonable time scale and prior to them being transported anywhere else. This policy does not affect your legal rights. This policy excludes made to measure items (items made to the consumers specification) (see section 6). Bluemoon Beds cannot be held responsible for failed deliveries made outside of this time or losses/damage made by your carrier. 12.7 If you are unable to arrange your own carriage we will arrange this on your behalf through our carriers. Collections from customers are available Monday - Friday and are an all day service 8am - 6pm. The drivers cannot call before collection and we cannot provide a narrower time window. The charge for collection will vary depending on size of items and location. Please ask a member of staff for the associated costs. Bluemoon Beds cannot be responsible for failed or delayed collections. 12.8 Should you wish to cancel your order or return your goods due to a manufacturing fault, once the fault has been confirmed, we will be happy to carry the associated carriage costs and make the necessary arrangements. We will then issue the most appropriate address. 12.11 Orders cancelled after Bluemoon Beds has processed/dispatched the product, will be considered as a return. See above for the possible charges. 13.1 All mattresses usually take up to 6 to 8 weeks approximately to settle to its specified tension. The two-side mattresses need to be flipped over every 2 weeks for the initial 3 months, thereafter every 6 weeks. The one-sided mattresses need to be rotated, so the head-end becomes the foot-end, every 2 weeks for the initial 3 months, thereafter every 6 weeks. All mattress tensions are based on an average individual person weighing between 12 to 14 stones. The natural fillings in some of the mattresses may give out odour for the initial 3 weeks. When opening a vacuum packed mattress, please allow up to 4 hours for the mattress to be fully expanded and also to eliminate any odours from the packaging. 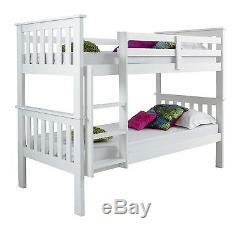 The item "CONTEMPORARY SOLID WHITE BUNK BED SET + 2 MATTRESSES" is in sale since Thursday, February 24, 2011. This item is in the category "Home, Furniture & DIY\Furniture\Beds & Mattresses\Beds with Mattresses". 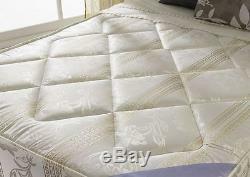 The seller is "bluemoonbeds" and is located in United Kingdom. This item can be shipped to United Kingdom.